give a fig | Get stuffed! 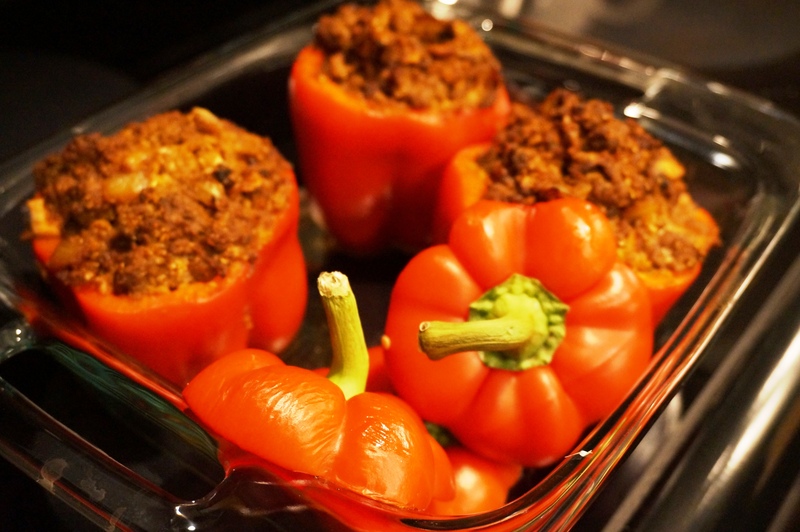 Er rather…get your peppers stuffed! 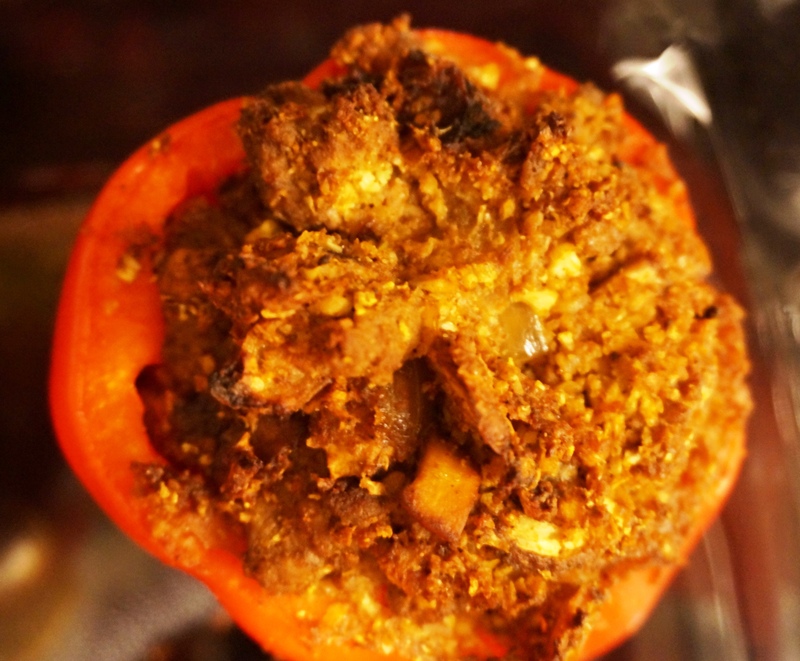 After partaking in a little stuffed pepper deliciousness at a lovely dinner over the holidays, I decided to whip up my own batch using only ingredients that I had on hand. The result of my creative little bit of this, little bit of that was a quiet but triumphant masterpiece of flavour. No trumpets, no grandiose announcement upon exiting the oven. Just the enticing scent of something good to come. And a direct hit on the comfort button. And a sideline score on the health barometer. I decided to take a break from the usual rice or quinoa in the stuffing mix, and instead tossed half a head of cauliflower florets into the food processor to quickly whirl into ‘rice.’ Great choice! ‘Rice’ cauliflower florets in food processor. Set aside. Heat large skillet over medium heat; melt 1-2 tbsp coconut oil. Add chopped onion and saute until translucent. Add mushrooms and saute until soft. Add garlic, ginger and spices; cook 2-3 minutes. Place in bowl and put aside. Using same skillet, melt additional coconut oil. Add ground bison and saute until cooked through, breaking into small pieces. Add onion mixture and cauliflower rice. Mix well. Taste and season with additional sea salt if needed. 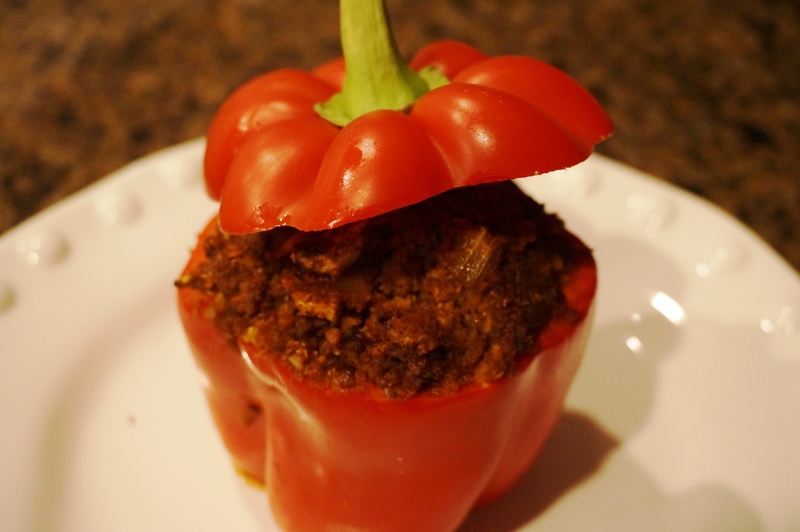 Carefully cut off tops of peppers, scoop out stuff inside, and trim bottoms to make flat (and help stand without falling over); arrange in baking dish. Stuff peppers to the gills with the meat mixture (and freely indulge in any leftovers that don’t fit!). Sit pepper tops in the dish. Place in hot oven for 20-30 minutes or until warmed through and the peppers are somewhat soft. The fragrance will woo the daylights out of you! 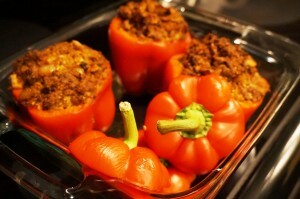 Frankly, these are even better warmed in the oven the next day as the spices have more time to nestle in.